Exclusively at Survival Metrics! 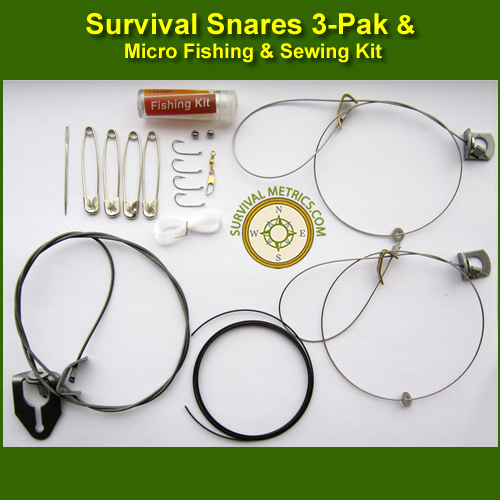 The Survival Snares 3 Pak and Micro Fishing / Sewing Kit was designed for us exclusively by Thompson Snares, the trusted leader in snare technology. Inside the kit is essentially everything you need to maximize your potential of catching food in a survival situation. Three snares, plus tie wire and instructions form the land component. A micro fishing kit (which doubles as a sewing kit) provides the water component. All of these tools are enclosed in a heavy duty 6 mil carrying pouch which you can easily pack into any emergency preparation or survival kit. Thompson Snares are made in the USA, and these particular snares are designed to capture small game such as squirrel, weasel, marten and other climbing animals. They are also good for snaring grouse, rabbits or woodchucks. These snares are the ultimate in small snare construction and efficiency. Made of steel cable and steel locks/swivels, they enable a sure-secure trap that significantly out performs typical wire snares. Thompson Snares are also more humane to the animal, because they are less likely to fail like other snares that can injure the animal and allow them to escape. By using Thompson Snares, you give yourself the best advantage in a survival situation, and that can make all the difference. The addition of the Micro Fishing and Sewing Kit rounds out this combination package to handle survival food security for both land and water opportunities. Together, they form a comprehensive survival food security kit that is lightweight and compact, but comprehensive enough to handle the vast majority of food opportunities that occur during a typical survival scenario. It is well known that trapping, snaring and fishing are the best methods of securing animal food supplies during a survival scenario. It takes less energy to perform, is easy to manage, and is less dangerous to the survivor than traditional hunting when done properly. Trapping, snaring, and even fishing can be done in a passive manner whereby once you set lines and traps, you need only check them about twice daily; attending to properties such as positioning, bait types, camouflage and of course, harvesting. This saves vital calories during a survival scenario versus hunting, and is usually much more successful at providing food. Survival is oftentimes more than just starting a fire, signaling, and staying dry. At some point, you will need to think about food. 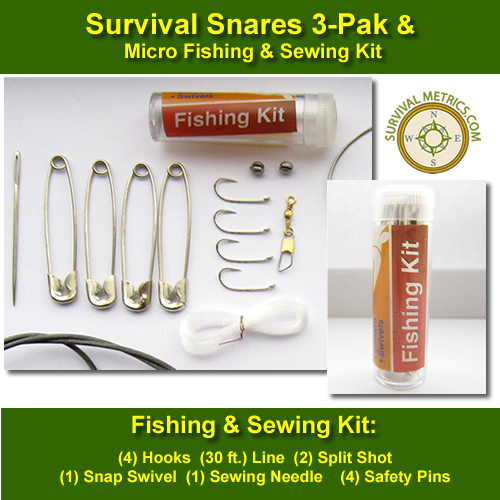 Give yourself the best chance for food security you can by getting the Survival Snares 3 Pak and Micro Fishing / Sewing Kit, exclusively at Survival Metrics! WARNING: Use of snares is a regulated activity. Thompson Snares and Survival Metrics are not liable for any customers violation of local, state, or federal regulations. It is the trappers responsibility to comply with all local, state, and federal requirements. International regulations must also be complied with.